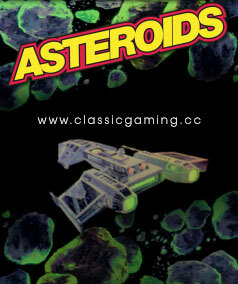 Asteroids is a two-dimensional vector shooter. 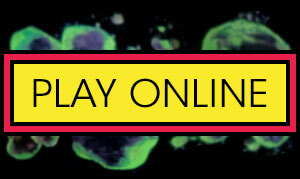 You control your spaceship, dodging and destroying an endless supply of asteroids. In addition, alien UFOs appear periodically and must be delt with as well. In order to become a master of this game, you must be familiar with the controls. Unlike many games from this era, there is no joystick. The player controls their ship using a series of buttons. The playing field consists of your spaceship, floating asteroids, and the occasional alien taking shots at you. You control the spaceship to avoid collisions and to blast obstacles. You start with 3 spaceships. On the normal machine set up, you earn a free spaceship every 10,000 points. When you start the game, your spaceship will be in the middle of the screen. Heading toward your ship will be anywhere from 4 to 6 large asteroids. Your job is to blast those rocks. However, when you blast them, they break up into 2 medium rocks. Blasting a medium rock gives you 2 small rocks. In addition, you have to contend with large and small saucers. You can have 4 shots on the screen at any one time. This is useful for when you are blasting rocks at close range. You can pretty much drill them to dust. Your shots "wrap around" the screen. This means any shot that goes past the edge of the screen will reappear on the opposite side traveling the same direction. The saucers also have "wrap around" shots. After 10,000 points, the small saucer becomes a permanent part of the game. You can no longer sit in one place since the small saucer is able to track your ship and take you out with the first or second shot. Use hyperspace only in very desperate situations. For example, if you have 4 asteroids coming at you at once, and there is nowhere to escape. Hyperspace will get your out of danger, but can possibly warp you into an even worse situation. Use the thrust carefully or you will find yourself careening out of control on the screen. First, blast every asteroid until you have only one small rock left. Go sit in the upper left or right corner of the game screen. If the small saucer appears from the side you are on, then you can destroy it before it gets off a shot. If it appears on the opposite side, use the shot "wrap around" to take care of it. Some people have done this for hours on end and have racked up scores in the millions. Of course, it takes a long time at 1000 points a pop. Also keep in mind that the small saucer can wrap shots so you may have to move out of danger.